In Ontario our susceptible species include American and Siberian Elms. This fungal disease may begin with yellowing and dieback on a single branch. As the infection spreads, wilting and yellowing of foliage, as well as dieback spreads throughout the crown. Dead leaves remain on the tree. Symptoms are more noticeable when the weather turns hot. Brown streaks are visible in the sapwood of infected trees. The pathogen can remain alive in the streaked wood for extended periods of time. Left untreated, the disease is usually fatal. 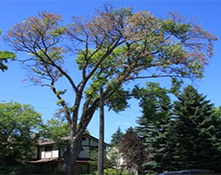 Drought stressed trees are more susceptible. The fungus travels within the sapwood of the tree, causing brown streaks; it can be spread from infected trees to healthy ones through root grafts, and by bark beetles carrying spores. 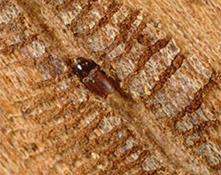 European elm bark beetle and the native elm bark beetle are vectors of the fungus that causes Dutch elm disease. The beetle deposit spores as they bore into cambium and sapwood and lay eggs in galleries that they create in the wood under the bark. 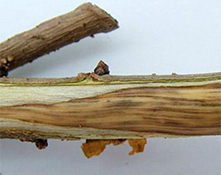 Verticillium wilt also affects Elm trees and produces brown streaks in the sapwood. Your field diagnosis must be confirmed by sending a sample to a diagnostic lab for positive identification of the fungus. Where possible, sever root grafts between diseased and healthy Elms. Systemic fungicide injections in conjunction with sanitation pruning (the removal of large limbs at the first sign of the disease may be warranted for valuable specimens if symptoms have not progressed too far but should only be attempted by a qualified arborist. This product may be effective when used where 1) 20% or less of canopy is showing wilt symptoms; 2) infested branches are removed at the first sign of wilt; 3) leaves have fully expanded and plant is actively transpiring (late May, June and early July). Cut dead trees immediately and remove bark from any Elm logs kept for firewood to prevent its use as a breeding site by elm bark beetles. Hybrids that show resistance include “Regal”, “Urban” and “Pioneer”.